Actually walking three blocks to the liquor store is for suckers. Drone delivery is clearly the way of the future, which is why Southern Comfort is offering to chopper booze straight to your door. 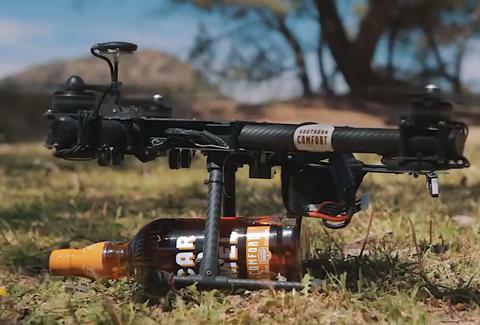 After four years of development, the liquor company is ready to launch their "SoCo 2Go" drone delivery system in select cities. Southern Comfort is currently asking fans to submit their ZIP codes -- the places with the most submissions will serve as the first test markets, but Southern Comfort plans to take the drone delivery system nationwide by the end of the year. SoCo 2Go will specifically hype the brand's new Caramel Comfort, which debuted earlier this month. You can watch a droid transport that caramel cargo in the demo below. Prank? Southern Comfort's not admitting anything yet, but suddenly, Seamless: No Human seems like a distinct reality. Kristin Hunt is a Food/Drink staff writer for Thrillist, and would like her liquor to be delivered by parachute. Follow her at @kristin_hunt.